This post was inspired by Samson, a domestically-bred African Serval that was killed by a truck after roaming freely on Vancouver Island, Canada. While I don’t know the circumstances behind his escape, it is apparent that some education of pet parents about exotic cats is in order. For starters, they must be harnessed or in a secure enclosure whenever they’re outside, and they’re not legal to have in all locations. The dietary requirements of exotic cats like the African Serval is also cause for concern. These are not your average domesticated house cats and they shouldn’t be fed like one. Their wild diet consists of birds, rodents, rabbits, reptiles, fish, and insects. The good news is the available cat food on the market includes options like whole meat and raw food, which is ideal for exotic animals that have had no opportunity to adapt to captive diets. Feeding 2-3 pounds of a variety of meat to an African Serval will meet most of it’s nutritional requirements. There is also a commercial food designed for exotic cats made by Zupreem . All of the above can easily be mixed into food purees or baked into healthy treats. Before adding any supplements to your Serval’s diet, please check with a veterinarian who has experience with exotic cats to avoid drug interactions or other complications. Exercise and mental stimulation are very important for the Serval cat. They require a large outdoor enclosure with a deep fence and high, covered top. 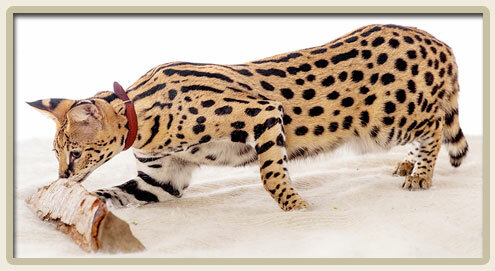 There should be a constant effort to allow Servals to use their instincts with hunting games and sturdy toys. They’ll also appreciate a small pool to play or fish in, and they love to dig holes. Don’t expect them to change their nocturnal ways, they’ll want something to keep them entertained at night. With proper care, an African Serval can live for a couple of decades. If this all sounds like too much for you, don’t convince yourself they’ll adapt to what you are willing to provide. They will not. There are many hybrid and exotic looking cat breeds available that will be more suitable for you. Have you ever owned a domesticated wild cat or hybrid? Please share your experience in the comments below. I don’t think they’re pets at all and it should b banned everywhere! There’s no excuse to not know this stuff with the internet available to anyone!!! So sad and needless!!! !